Margus Hunt loodab algaval hooajal vähem pingil olla ja rohkem väljakul tegusid teha, kuid kõigepealt peab ta jagu saama selgavigastusest. A fresh NFL record set by the club where Margus Hunt plays American football – never before has a team dropped off at round one in play-offs four years running. Lousy playing, no will to fight i.e. the typical play-off Bengals, said the US experts after Indianapolis Colts’ 24:10 win. But let the experts have their say. Mr Hill is 100 percent right. While the Colts had people outdo themselves and set personal records during said game, Bengals had their main pillars mightily underperform – between the two of them, Jeremy Hill and Giovani Bernard covered a miserable 99 yards. «I just could not press thru,» admitted Mr Hill. Honest, but what’s the use? And, when it comes to Mr Green and others playing, look to last year’s play-off against San Diego Chargers – demolished 10:27. Like last year, Bengals again did a catastrophic second half. Against Chargers, they went to the break at a 10:7 lead, now with Colts behind by bare 10:13. Winnable games both of them. In both cases, no more was scored during 2nd half. What sayeth the coach? For Mr Lewis, the second halves over six play-off amount to depressing 13:84. In the locker room, one draws the conclusions, gives the new guidelines, stirs the guys to fight... and they do a total flop. What’s up? What lesson? Did the former five defeats not teach the main coach a thing or two? By the way: the contract is soon up for Mr Lewis, but the experts do not think he’ll hear good-bye. The man, they say, is buddies with Bengals’ owner who is satisfied when the team progresses to these very play-offs. Unbothered by what the fans think. After the defeat, Mr Dalton did his usual mantra of «we played poorly and need to be better next time». Fine. Just what he said last year. And what he’ll say a year from now. And as for the defence – highly praised after the season’s initial victories and also including our man Mr Hunt – all are wondering what went wrong to drop them to be worst in the league. The Colts quarterback Andrew Luck was rather free to roam as he pleased – just once felled by Mr Hunt and his fellow. For the rest of the time, he could have ordered Chinese food, have it delivered and eat the spring rolls before passing the ball – as a newspaper put it. Deep thinking ahead for Bengals. The last win in play-offs dates back to January 1991. With no changes, the defeatist era keeps getting longer. 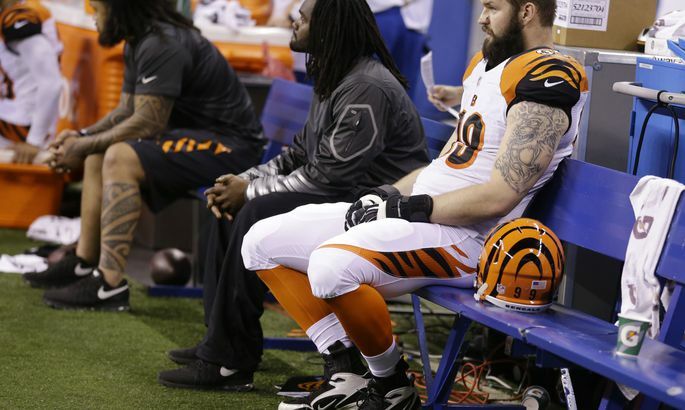 Cincinnati Bengals defensive end Margus Hunt has been both ways. For a month, he was out due to injury. As for the rest of the time, he was in the game for less time than second half last season as the fellow players stayed more-or-less unhurt. Meanwhile, once in the game he was not bad at all. Against Indianapolis Colts, he secured the single sack of opponent quarterback. True, together with a partner, but Mr Hunt did most of the job. Thus, read the statistics for Mr Hunt for this past season: 12 games; 1.5 sacks; tackles 7 (5 on his own and 2 with partner); one cut of pass by hand. Not impressive, really... But, considering the time spent playing, not depressing. At that, the fans totally differ from Bengals main coach Marvin Lewis and defence coach Paul Guenther – even by Twitter, during this year’s play-offs while Mr Hunt did sack the quarterback, dozens of Bengals fans demanded that the Estonian play more. In vain – Mr Hunt could only play when Carlos Dunlap needed some rest. In an interview to Estonian Public Broadcasting (ERR), Mr Hunt declared he was more-or-less satisfied with the season. Obviously, however, the next season will be decisive: he must make it to starting lineup – no lower aim will do.